The lion is enacted by two dancers. One handles the head, made out of strong but light materials like paper-mache and bamboo, the other plays the body and the tail under a cloth that is attached to the head. The 'animal' is accompanied by three musicians, playing a large drum, cymbals and a gong. A Little Buddha teases it with a fan or a giant ball. The head dancer can move the lion's eyes, mouth and ears for expression of moods. This dance has evolved from an old folk dance in China. 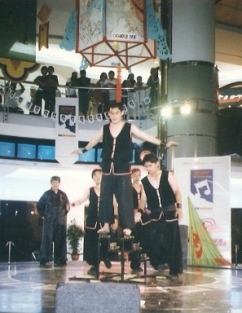 Thanks to the adaptation of the acrobats, it has become a very popular number with the audience. There are two types of lions: big lion (played by two acrobats) and small lion (played by one man). 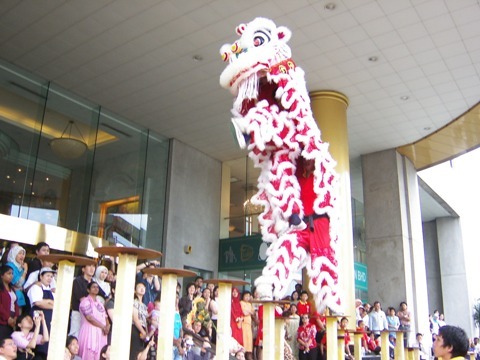 They not only perform the various movements of the lion, rolling and jumping but also vividly portray the lion's strength and agility, and the quiet and playful side of the lion's character as well. 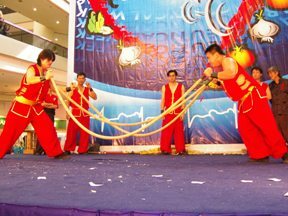 Accompanied by the rhythmic Chinese traditional percussion instruments, it brings out a gay and festive atmosphere, vivid and jubilant. 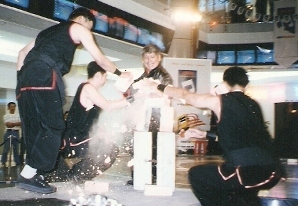 Martial arts or Wushu, have been created and developed for self-defense and survival throughout human history. Correct Chinese Wushu training improves physical ability, health, and willpower; it gives an individual an excellent method of exercise, a personal art form, a competitive sport, and a basis for self-defense and sparring. 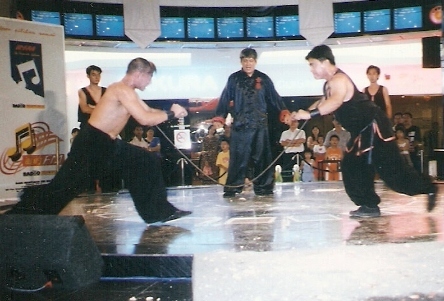 Total martial training includes Ti (kicking), Da (punching), Shuai (throwing), Na (controlling), Gi (hitting), Ci (thrusting), etc. Related to each style are basic forms, or sequences, which may involve defense strategies, offense, retreat, mobility and immobility, speed and slowness, hard or soft postures, emptiness and fullness, with or without weapons. Other training will include practical defense using that particular style, defense simulation such as two-man choreographed sequences for beginning contact training. There are also internal and external body training methods to strengthen the body to withstand strikes and blows. In the advanced stages of training, a student begins full-contact training by sparring with semi-control in order to add realism to the training. 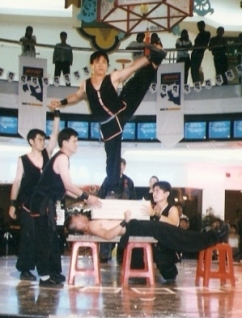 Wushu (literally, "martial methods") was historically termed "Wu-Yi" or martial arts. Fairly recently, the Chinese government changed the term to "Guoshu," or "national method." The term most popular in North America is "Kung-fu," which actually means one's ability in any skill, not necessarily martial. 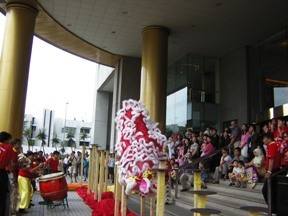 The drum is used to accompany the Lion's or Dragon's movements during the dance. The base is made of wood with spring coils inside that gives the drum more emphasis. The top surface is made from preserved ox skin pinned to the sides and finished off with layered gloss. It is also usual for the drum to be decorated with a variety of design patterns. 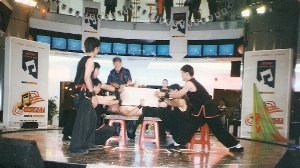 The music of the performance is arranged in different patterns that the dancers must be very familiar with and be able to follow. Each pattern signifies certain movements and with each beat, the drummer can communicate to the lion or dragon as to which movement to perform. The lion and dragon can communicate to the drummer by making subtle gestures since they cannot give audible signals to the drummer. When everything is in play, the performance can display a high degree of orchestration and effective story-telling. Once the basic drum has been mastered, the drummer can advance to the next level by learning advanced techniques and create their own personalised beats. The cymbal is made from brass and attached together with a small rope. At the a bare minimum, at least one cymbal is played together with the drum but usually there are more than one. It can be played with soft and loud variations in order to make the music interesting. To make a successful rhythum, both the cymbals and drum should be played in time and with the correct technique. 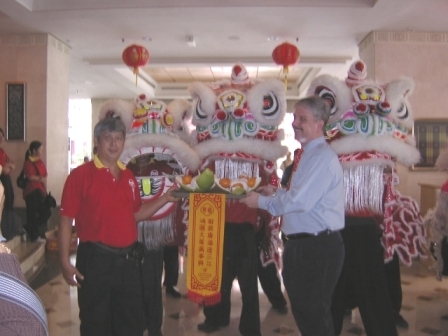 Finally, a gong is also used during a lion dance to give the music a more defined sound. It should be played in time with the main drum beat.